Why should I want to create my own subliminal CDs? What do I get with the Subliminal-Studio package? Is all your audio royalty-free? Can I use it commercially? Will the Subliminal-Studio package run on my computer? Q. Why should I want to create my own subliminal CDs? A. There are MANY reasons you really should create your own subliminal recordings. Firstly, do you really TRUST the third-party CDs you buy from bookstores and New Age shops? Many lower budget CDs include flawed subliminal messages, including words such as "Not" and "Don't." These negative phrases can have a seriously detrimental effect on your self-development. You also need to be wary of less reputable companies include sales prompts in their messages. Secondly, mass-produced CDs usually can�t address your own personal needs and desires. By creating your own CDs, you can choose EXACTLY which messages you want to use. Be as specific as you want. They should work MUCH better than any general "diet" or "memory" CD. Thirdly, your brain is more complicated than "one size fits all" subliminal CDs. When you're controlling the process, you can use the subliminal message delivery techniques you feel most comfortable with. This will provide a HUGE boost in effectiveness. And finally, COST. Wouldn't it be nice to simply know you can produce your own subliminal CD, on any topic, with just a few clicks of your mouse? And it'll cost you just PENNIES. If you're creating CDs for commercial use, the advantages are obvious. The subliminal CD market is huge and the startup cost is small. You can retail locally, setup your own store distribution network, or sell customized subliminal recordings via eBay. We require NO extra payments or back-links, and ALL the audio we include in our package is totally royalty-free (and worth thousands!). Q. What do I get with the Subliminal-Studio package? A. Subliminal-Studio is a CD package containing our exclusive electronic guide "Developing your own Subliminal-Studio", along with two-and-a-half hours of New Age music, twenty-two professionally recorded subliminal scripts in MP3 format, three one-hour nature sound recordings, and two hours of binaural beat recordings. 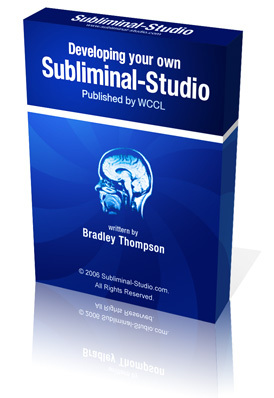 In addition, you'll find a FULL copy of MindSync, a binaural beat frequency chart, a time-limited edition of Adobe Audition, and an EXCLUSIVE script for automatically generating your own "Silent Subliminals." This is all delivered on CD direct to your door, with FREE international shipping. We think you'll LOVE what we've prepared for you! Q. Is all your audio royalty-free? Can I use it commercially? A. All the audio in our Subliminal-Studio package comes with a royalty-free license. This means you are entitled to redistribute in non-original form in any manner you deem fit. Use it in your commercial recordings without issue... NO license fees or hidden costs to pay! Q. Will the Subliminal-Studio package run on my computer? A. To run the Subliminal-Studio CD package, you will need a Windows PC with a sound card. It's also advised that you have a microphone to record your own affirmations, however this isn't necessary (we provide 22 professionally-recorded subliminal sessions for you to use right away!). A. You can rest assured that your purchase contains everything we say it does. If you don't receive everything we promise, we'll refund you 100%. And if you have problems with your CD, we'll work with you to sort them out, or simply send you a replacement CD FREE of charge. A. We ship out your CD the very evening we receive your order. If you live in the UK, you should receive your CD within just a couple of days. If you live in the USA or elsewhere, it may take around a week to arrive at your door. A. If you have further questions, or need support in using your CD collection, then we're always at hand to help. You can contact us at any time of the day or night through our dedicated support site, myHelpHub.com. Simply open a support ticket and we'll respond within an average of just four hours. We also provide online chat support during peak periods so you can always get help when you need it. EASY! Order YOUR Personal Subliminal Studio Today!